What happens in music processing that allows the brain to change? Let’s now begin with what we do know. Let’s take a look at stroke victims for example. What area’s of the brain that we do know are affected by a stroke patient. As a general rule of thumb we know that movement, speech, language and in some cases vision are affected during a stroke. Let’s stick with these four area’s: movement, speech and vision and language. 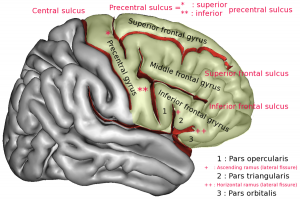 Check out the blog that I wrote on the brains of musicians are more developed than the brains of non-musicians which takes us back to the left inferior frontal gurus (IFG) of the brain. Just in case here is a recap. This would consist of four systems of the brain: the auditory cortex (hearing), the visual cortex (sight) and the motor cortex (movement), the left frontal lobe (language dominant hemisphere). These four systems are located on both the right and the left hemispheres of the brain. The IFG is a region of the brain that sits in front of the motor system and it has rich inter- connectivity between both right and left hemispheres of the brain (auditory and motor). During the research it was determined that this region of the brain is more developed in adult musicians than in adult’s that were not musicians. Hence the inter connectivity between systems. The study has determined that music making changes the structure and function of these multi-modal integration systems in the brain which creates a ripple effect that expands those surrounding systems. The more language, hearing, speech, vision and motor domain were utilized by-way-of practicing a musical instrument, singing and movement, the more developed these particular systems became. When a music therapy patient takes a particular test or performs a task that is musical in nature (moving to music) to reach a non-musical goal (walking) this expands the structure and function of those closely related non-developed systems of the brain to become more developed.